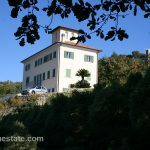 In Bordighera is this detached country house for sale 100 m² on two floors in with view of the valleys and the in the distance the sea. At a short distance from the village Sasso and at 5 minutes’ drive from the beaches of Bordighera. Around the house is a large garden of 400 m² with a few olive trees. The country house Located on the southwest. Under the “piano casa” law it is allowed to extend the house with another 15 m².